Italian for “cooked cream,” panna cotta is a culinary paradox; its luxurious texture belies its ridiculously simple preparation. A judicious amount of gelatin is the secret to perfect panna cotta: too much and your dessert will bounce like a Jell-O jiggler, too little and you’ll wind up with a sad, runny pudding. 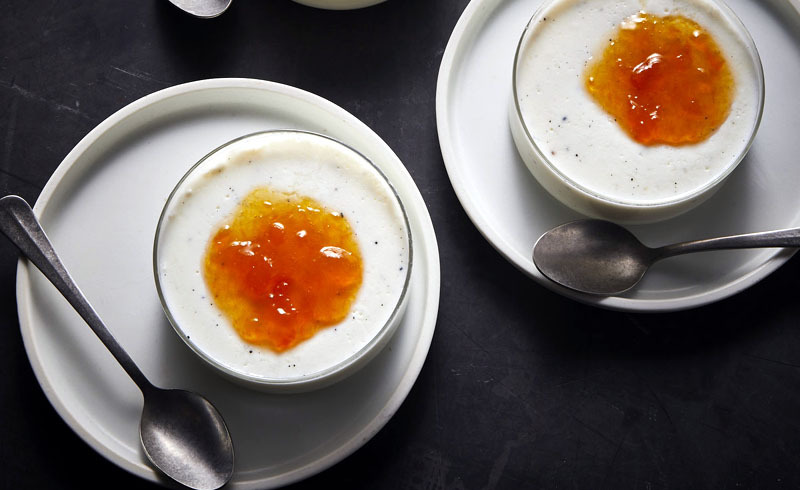 We’ve nailed the proper ratio in this recipe, which yields a perfectly soft-set panna cotta with just the right amount of wobble. Fresh vanilla bean seeds perfume the base mixture, while creamy buttermilk adds a balancing tang. The smooth sweetness of this dessert begs for a hint of acidity and tartness; a warm dollop of your favorite sweet-tart jam or preserves will do just the trick. Sprinkle gelatin over 3 tablespoons cold water, and let stand 5 minutes to dissolve, stirring once. Meanwhile, heat milk and sugar in a small saucepan over medium. Cook, whisking often, until sugar dissolves and mixture is hot, about 5 minutes (do not boil). Remove from heat; whisk in gelatin mixture until fully dissolved. Let cool slightly, whisking occasionally, about 10 minutes. Scrape seeds from vanilla bean pod into gelatin mixture; discard pod. Gently whisk in buttermilk and salt. Divide mixture evenly among 8 (12-ounce) straight-sided glasses (about 1/2 cup each). Cover and chill until set, at least 8 hours or up to overnight. Serve in glasses or invert onto serving plates. Spoon about 2 teaspoons jam or marmalade on each serving.